The majority of studies to date have focused on the effects of work stress in the nursing environment, with the effect of personal stress in nursing being less explored. This study sought to determine whether personal stress is a more significant predictor of burnout, job satisfaction and general health than work stress. Of the 1200 nurses randomly selected to participate in the study, 895 agreed to complete six questionnaires over 3 weeks. Data was analysed using hierarchical multiple linear regression. Findings revealed that personal stress is a better predictor of burnout and general health than job satisfaction, which is better predicted by work stress. The findings of this study could inform potential solutions to reduce the impact of personal and work stress on burnout, job satisfaction and general health. Coping strategies and staffing strategies need to be evaluated within developing contexts such as South Africa to ascertain their effectiveness. Nursing is one of the most stressful professions owing to the emotional nature of patient demands, long working hours and inter-professional as well as interpersonal conflicts. In recent years, new healthcare technologies, budget cuts and changing healthcare environments continue to increase personal and work stress among nurses (Jennings, 2007). In South Africa, there has also been a recent transition in health care from hospital based services to primary and community based services within the public and private sector. This exacerbates stress among nurses who are now responsible for larger populations (Koen, Van Eeden, & Wissing, 2011). As such, nurses consistently report higher stress compared to other health professionals (Williams & Smith, 2013). This affects job satisfaction while invoking feelings of inadequacy which can lead to burnout and compromised wellbeing of nurses. Such effects have implications for productivity and performance (Najimi, Goudarzi, & Sharifirad, 2012). Conceptually, personal stress includes stress experienced in the home environment including ongoing health problems of loved ones, relationship problems as well as financial problems (Bromberger & Matthews, 1996) whereas work stress includes stress experienced in the work environment related to patient care, job demands, staff issues, lack of support and overtime (Rothmann, Van Der Colff, & Rothmann, 2006). These stressors have been known to affect burnout, job satisfaction and health outcomes through a pattern of physiological, emotional, behavioural and cognitive processes (Jennings, 2008; Young, Schieman & Milkie, 2013). In the literature, studies have mostly focused on the effects of work stress in the nursing environment (Khamisa, Oldenburg, Peltzer, & Ilic, 2015; Khamisa, Peltzer, & Oldenburg, 2013; Kumari & De Alwis, 2015; Makola, Mashegoane, & Debusho, 2015; Sekol & Kim, 2014), with the effect of personal stress in nursing being less explored. Evidence shows that work stress contributes to higher burnout levels among nurses and is associated with lower job satisfaction (Graham, Davies, Woodend, Simpson, & Mantha, 2011). Prolonged work stress negatively affects physical and mental health outcomes among nurses (Idris, 2011). In relation to personal stress, one study among Chinese nurses found that it interferes with work, thereby contributing to higher burnout levels (Wang, Chang, Fu, & Wang, 2012). Other studies among Pakistani and South African nurses found that personal stress significantly predicts job satisfaction (Makola et al., 2015; Zulfiqar, Khan, & Afaq, 2013) and is significantly associated with health and wellbeing (Burke & Greenglass, 2007; O'Donovan, Doody, & Lyons, 2013). A review of studies exploring personal and work stress among nurses suggests that difficulty balancing work with family responsibilities has negative outcomes including depression and suicide (Killien, 2004). Although it is known that work related stress and burnout are associated with poor physical and psychological health outcomes (Piko, 2006), there is limited evidence regarding the relationship between burnout and job satisfaction, especially in developing contexts. Limited evidence suggests that emotional exhaustion is more significantly associated with job satisfaction than general health (Khamisa, Peltzer, Ilic, & Oldenburg, 2016). Maslach's Burnout Model has been used to explain the relationship between work related stress, burnout, job satisfaction and general health of nurses. Prolonged exposure to work related stress contributes to high burnout which leads to lower job satisfaction owing to depletion of resources necessary to meet job expectations. This jeopardises coping mechanisms through breakdown of biological systems, thereby inducing strain and negatively affecting health outcomes (Janssen & Van Yperen, 2004; Khamisa et al., 2016; Maslach, Schaufeli, & Leiter, 2001). This situation is further exacerbated when conflict is experienced between pressures of family and pressures of work, making it difficult to fulfil one role by virtue of the other (Kahn, Wolfe, Quinn, Snoek, & Rosenthal, 1964). Such conflict between family roles and work roles affect one's ability to meet job expectations, thereby compromising job satisfaction (Lourel, Ford, Gamassou, Gueguen, & Hartmann, 2009). Inability to meet demands at work owing to energy and time being dedicated to family roles (Grzywacz & Marks, 2000), depletes resources necessary for coping, thereby negatively affecting health outcomes (Cannon, 1939; Maslach, Jackson, & Leiter, 1996). These pathways can be understood using the concept of stress proliferation, whereby a stressor or set of stressors can develop beyond a given situation, resulting in additional stressors affecting a number of outcomes (Ward, 2014). Majority of research focusing on work stress places less emphasis on the role of personal stress, which is especially important in developing contexts characterised by poor economic conditions and high unemployment rates, whereby personal stress spills over into the workplace (Houtman, Jettinghoff & Cedillo, 2007). For example households with one breadwinner and several dependents may experience financial strain, which have been found to interfere with the work role (Pearlin, Schieman, Fazio & Meersman, 2005). In South Africa, average disposable income amounts to R16,710 compared to equivalent R38,900 in the US and R35,300 in the UK (Numbeo, 2016). Nurses are not an exception to this and in addition to being exposed to stressful work environments personal stress may exacerbate the consequences for patient care. The aim of this study is to examine the effect of personal stress on burnout, job satisfaction and general health of nurses. This study seeks to determine whether personal stress is a more significant predictor of burnout, job satisfaction and general health than work stress. It is hypothesised that personal stress is a more important predictor of burnout, job satisfaction and general health of nurses. A total of 1200 nurses were randomly selected to participate in the study, 895 (75%) agreed to complete the questionnaires. The sample consisted of 46% black nurses, 85% female nurses, 59% private hospital nurses, 28% of nurses over 50 years of age, 72% of nurses with diplomas/certificates and 27% of nurses with more than 25 years working experience. Most nurses in the sample worked between 4 and 6 days and 31-40 h per week. 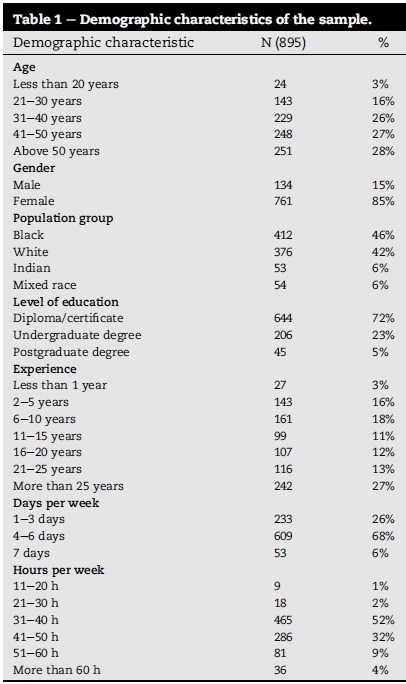 Additional demographic characteristics of the sample are included in Table 1. Following ethics approval (REC 3/20/03/12), permission was also obtained from the Gauteng Department of Health in South Africa as well as management at the hospitals from where participants were selected. All participants provided informed consent prior to completing the questionnaires. Four hospitals across the province of Gauteng were selected using stratified random sampling. Private and public hospitals in the province were stratified by area and size after which two private and two public hospitals were randomly selected. Unit managers at the chosen hospitals were requested to randomly distribute invitation packs containing an explanatory statement, consent form, six questionnaires and a sealable envelope. Participants were given 3 weeks to complete the questionnaires, with reminders being issued verbally and in the form of posters placed on notice boards 2 weeks after initial questionnaire distribution. Participants were asked to return the completed questionnaires together with signed informed consent forms in sealable envelopes provided to them. The sealed envelopes were to be placed in sealed boxes placed around the hospital. These were only accessible to the researchers. During data entry the participants were de-identified to ensure anonymity. Data was securely stored in a locked safe as well as on password protected databases. Data was collected in December 2013. Participants were given six questionnaires including a socio-demographic questionnaire (SDQ), Chronic Burden Scale (CBS) (Bromberger & Matthews, 1996), Nursing Stress Inventory (NSI) (Rothmann et al., 2006), Maslach Burnout Inventory-Human Services Survey (MBI-HSS) (Maslach et al., 1996), Job Satisfaction Survey (JSS) (Spector, 1985) and General Health Questionnaire (GHQ-28) (Goldberg & Hillier, 1979). The SDQ asks about the age, gender, level of education, level of experience, population group, and number of days/ hours worked per week. The CBS measures ongoing personal stress related to personal health problems, health problems of loved ones, relationship problems and financial problems. It consists of 5 items with each item designed to determine presence as well as chronicity and severity. Participants indicated 'yes' or 'no' for whether they experienced ongoing stress for each of the 5 items and whether the stress persisted for 6 months or longer. Participants also rated their experience of stress as being 'not very stressful', 'moderately stressful' and 'very stressful'. Responses were scored as 1 for those who reported moderate to severe stress in the last 6 months or longer and 0 for those who did not. High scores indicate high levels of personal stress (Bromberger & Matthews, 1996). The NSI measures the frequency and severity of five South African specific stressors including patient care, staff issues, lack of support, job demands and overtime. The first 39 of 78 statements were rated in terms of perceived intensity of the particular stressor on a 9-point scale, ranging from 1 (low)to9 (high). The remaining 39 statements were rated in terms of frequency over 6 months on a 10-point scale ranging from 0 (no days)to9+ (more than 9 days)(Rothmann et al., 2006). The NSI was reliable and valid among 1780 professional, enrolled and auxiliary nurses from seven provinces in South Africa with Cronbach alpha coefficients ranging between 0.91 and 0.93. The mean inter-item correlation coefficients were in the recommended range (0.15 < r < 0.50) (Rothmann et al., 2006). The MBI-HSS measured burnout using 22 items in the form of statements based on personal feelings and attitudes. This questionnaire contains three subscales. The emotional exhaustion (EE) subscale has 9 items and includes statements such as "I feel emotionally drained from my work", the deper-sonalization (DP) subscale has 5 items and includes statements such as "I feel I treat some recipients as if they were impersonal objects" and the personal accomplishment (PA) subscale includes statements such as "I feel I am making an effective contribution to what this organization does". The frequencies (scored 0-6) are categorized according to high, moderate and low for each subscale. High emotional exhaustion and deper-sonalisation as well as low personal accomplishment indicate burnout (Maslach et al., 1996). The MBI-HSS is a reliable measure of burnout amongnurses with Cronbach alpha values of 0.90 for EE, 0.71 for DP and 0.79 for PA (Maslach et al., 1996). It is reliable among South African nurses with Cronbach alpha coefficients exceeding 0.70 for all subscales (emotional exhaustion 0.78, depersonalization 0.74 and personal accomplishment 0.75) (Levert, Lucas, & Ortlepp, 2000). The JSS measures job satisfaction using 36 items across nine facets (pay, promotion, supervision, fringe benefits, contingent rewards, operating conditions, coworkers, nature of work and communication). Responses are scored on a 6-point scale ranging from "disagree very much" (1) to "agree very much" (6) in terms of how true the statement is (higher scores indicate "truer" statements). High scores indicate job satisfaction, with the scores on the negatively worded items being reversed before adding them with the positively worded into facet or total scores (Spector, 1985). The JSS is a reliable instrument with Cronbach alpha coefficients exceeding 0.70 for all the facets (Spector, 1985). The JSS has been found to be reliable among nurses (Cronbach alpha = 0.89) and shows good construct validity (Andersen & Andersen, 2012). The GHQ-28 measures perceived quality of health using 28 items across four sub-scales (somatic symptoms (SS), anxiety/ insomnia (AS), social dysfunction (SD) and severe depressive symptoms (DS)). The SS subscale contains items, such as "been feeling run down" and "been getting pains in the head". The AS subscale includes items, such as "lost much sleep over worry" and "feeling nervous and strung up all the time". The SD sub-scale includes items, such as "taking longer on things" and "enjoying normal day to day activities". The DS subscale contains items, such as "feeling worthless" and "feeling that life is hopeless". Positively worded items are scored from 0 (always) to 3 (never) and negatively worded items are scored from 3 (always) to 0 (never), with a high score indicating poor general health and vice versa (Goldberg & Hillier, 1979). The GHQ-28 has Cronbach alpha values ranging between 0.69 and 0.90 for all sub-scales (Goldberg & Hillier, 1979). The GHQ-28 is reliable (Cronbach alpha between 0.70 and 0.83 for all sub-scales) and valid (pclosefit = 1.00) among South African samples including nurses (Cronbach alpha = 0.84) (Koen et al., 2011). This study used a cross sectional design. Data analysis using IBM-SPSS Statistics Version 20 included a six stage hierarchical multiple regression. The sample size was sufficiently large for statistical analysis. Assumptions of normality, linearity and homoscedasticity were confirmed using residuals and scatter plots. Independence of errors was confirmed using the Dur-bin-Watson test (values between 1 and 3). Missing data were handled using listwise deletion (Tabachnick & Fiddell, 2001). Personal stress was entered at stage 1 of the regression, stress related to patient care at stage 2, stress related to staff issues at stage 3, stress related to job demands at stage 4, stress related to lack of support at stage 5 and stress related to overtime at stage 6. These were entered in the same order with burnout, job satisfaction and general health as dependent variables. R values were interpreted as variance explained by each predictor variable, R square change values were interpreted as additional variance explained after controlling for other variables, Beta values were interpreted as amount of unique contribution made by each variable when other variables are held constant, Significance was interpreted at p < 0.05. Results revealed that 86% of nurses experienced personal stress related to financial strain, 58% experienced high levels of work stress related to staff issues, 65% experienced high levels of burnout related to lack of personal accomplishment, 66% experienced low job satisfaction related to pay and 60% experienced poor general health related to anxiety and insomnia. Regression statistics are presented in Tables 2-4. 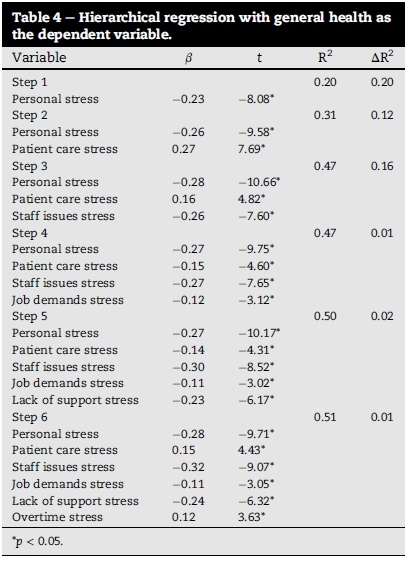 As seen in Table 2, hierarchical multiple regression revealed that at the first stage, personal stress contributes significantly to the model (F (5,1065) = 77.48, p < .05) accounting for 27% variance in burnout. In the subsequent stages, stress related to patient care explained an additional 10% variance in burnout (F (17,1053) = 35.81, p < .05). Stress related to staff issues explained an additional 6% variance in burnout (F (30,1040) = 25.50, p < .05). Stress related to job demands explained an additional 3% variance in burnout (F (37,1033) = 23.57, p < .05). Stress related to lack of support explained an additional 1% variance in burnout (F (40,1030) = 22.21, p < .05). Stress related to overtime did not explain any additional variance in burnout (F (43,1027) = 20.81, p < .05). As seen in Table 3 hierarchical multiple regression revealed that at the first stage, personal stress contributes significantly to the model (F (5,1075) = 36.67, p < .05) accounting for 15% variance in job satisfaction. 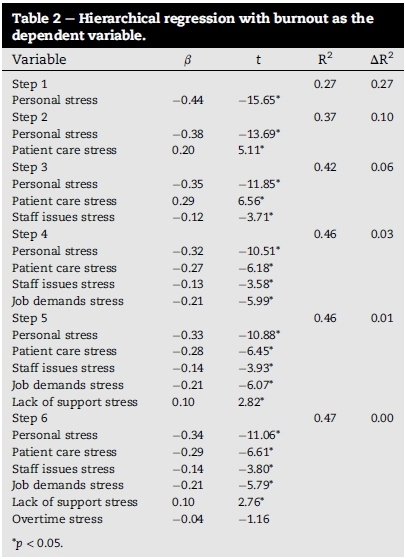 In the subsequent stages, stress related to patient care explained an additional 16% variance in job satisfaction (F (17,1063) = 27.90, p < .05). Stress related to staff issues explained an additional 22% variance in job satisfaction (F (30,1050) = 39.88, p < .05). Stress related to job demands explained an additional 2% variance in job satisfaction (F (37,1043) = 34.78, p < .05). Stress related to lack of support explained an additional 2% variance in job satisfaction (F (40,1040) = 34.66, p < .05). Stress related to overtime explains 1% additional variance in job satisfaction (F (43,1037) = 33.54, p < .05). As seen in Table 4 hierarchical multiple regression revealed that at the first stage, personal stress contributes significantly to the model (F (5,1075) = 51.98, p < .05) accounting for 20% variance in general health. In the subsequent stages, stress related to patient care explained an additional 12% variance in general health (F (17,1063) = 28.00, p < .05). 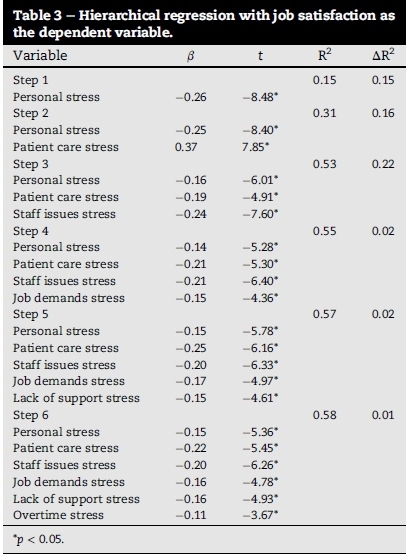 Stress related to staff issues explained an additional 16% variance in general health (F (30,1050) = 30.56, p < .05). Stress related to job demands explained an additional 1% variance in general health (F (37,1043) = 25.43, p < .05). Stress related to lack of support explained an additional 2% variance in general health (F (40,1040) = 25.82, p < .05). Stress related to overtime explains 1% additional variance in general health (F (43,1037) = 24.98, p < .05). The aim of this study was to examine the effect of personal stress on burnout, job satisfaction and general health of nurses. It was hypothesised that personal stress predicts burnout, job satisfaction and general health of nurses better than work stress. Findings showed that personal stress is a better predictor of burnout and general health but not job satisfaction. In line with the findings of this study, personal stress has been found to negatively affect work roles which result in employees experiencing high burnout (Wang et al., 2012; Yavas, Babakus, & Karatepe, 2008). Other studies have shown that exposure to prolonged personal stress negatively affects employees health outcomes (Burke & Greenglass, 2007; O'Donovan et al., 2013; Young et al., 2013). Additional studies showed that showed that experiencing chronic difficulties outside of work, such as ill health of a loved one or marital problems was associated with anxiety and depression (Weinberg & Creed, 2000). Simultaneous examination of the relationship between personal stress, work stress, burnout, job satisfaction and general health in this study shows that personal stress is a better predictor of burnout and general health. Wang et al. (2012), explained that personal stress interfering with work results in reduced psychological capital needed for coping, thereby leading to burnout. Depletion of resources necessary for coping (burnout), negatively affects health outcomes (Maslach et al., 1996). Contrary to previous studies showing that personal stress is a strong predictor of job satisfaction (Makola et al., 2015; Zulfiqar et al., 2013), this study showed that work stress associated with staff issues is a better predictor of job satisfaction. Previous studies confirm the association between work stress and job satisfaction (Graham et al., 2011). This and other studies reveal that staff issues and in particular staff shortages, result in higher workloads, which affect job satisfaction (Graham et al., 2011; Kumari & De Alwis, 2015). This is relevant for developing contexts such as South Africa, where staff shortages evident in the large number of vacant nursing posts (Makola et al., 2015) could explain the stronger relationship between work stress and job satisfaction compared to personal stress and job satisfaction. Furthermore, previous studies confirming the association between personal stress and job satisfaction (Makola et al., 2015; Zulfiqar et al., 2013) did not examine work stress. The simultaneous examination of these variables in this study allows for multiple comparisons to determine the nature of relationships. In referring to the findings of this study, it is recommended that nurses be trained on coping strategies to protect them against personal stress while preventing burnout and poor health outcomes. This has been found to be effective in some studies (Ford, Heinen, & Langkamer, 2007; Luthans, Avey, Avolio, Norman, & Combs, 2006). Work stress can be alleviated through addressing staffing issues for nurses (Jennings, 2008). This can be achieved through improved recruitment and retention policies (Buchan & Aiken, 2008). Evaluation procedures will help ascertain the effectiveness of such strategies, while potentially informing policy and practice in developing contexts such as South Africa. We would like to acknowledge the hospital, nurse and unit managers as well as participants at each chosen hospital, without whose support, this study would not be possible. We would also like to thank the funders Monash South Africa [grant number 230059-9999]. In conclusion, personal stress is a better predictor of burnout and general health among nurses but not job satisfaction. Recommendations include coping strategies and staffing strategies, which need to be evaluated within developing contexts such as South Africa to ascertain their effectiveness. Despite the large sample size, this study included a sample of nurses from one province in South Africa. It would be useful to replicate this study using South African measurement tools across the other provinces, to improve generalisability of findings. Generalisability is also limited in this study owing to the study population and study design. Self-report questionnaires are also a limitation in this study and using biomarker assessment to ensure more accurate measurement of indicators is suggested for future studies. Future research should also examine reverse relationships between the variables. Differences between nurses by occupational rank, language, level and type of care as well as nurses in public versus private hospitals should also be explored. * Corresponding author. Department of Public Health, School of Health Sciences, Monash South Africa, 144 Peter Road, Roodepoort, 1725, Johannesburg, South Africa. E-mail address: natasha.khamisa@monash.edu (N. Khamisa). Peer review under responsibility of Johannesburg University.